I must apologize to readers for the site being down yesterday. This was thanks to MadTV's hosts carrying out routine maintenance, during which they seem to have broken the connection to the F1 Insight sub domain; but all is well that ends well! The interesting thing about the downtime, however, was that an alternative URL worked throughout - so you could bookmark this link in case it happens again. Fasthosts have provided MadTV an excellent service with downtime averages well below industry standard so, hopefully, the back-up address won't be needed. To return to business as usual, I see that Bernie has been muttering again about not needing a GP in America. This happens regularly about this time of year and is all part of the strategy to get American circuit bosses to pay the exorbitant price of an F1 race - don't take it too seriously, therefore. It does raise the question of F1's impact in the States, however. From what I have seen, I would guess that the sport has a higher profile than ever before in the US, having built a knowledgable fanbase and with Champ Cars and the IRL losing popularity since their split. 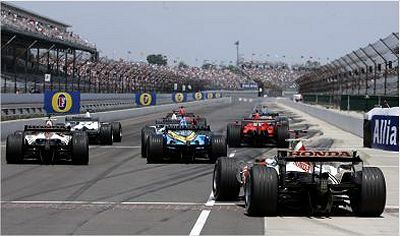 The fact that F1 has retained viewers in spite of the disasters of 2002 and 2005 indicates a solid core of support that it would be stupid to desert at this stage. It has taken years to build that support and Bernie does not help with his posturing in the interests of an ever-increasing price for staging a GP. This is more important than money; this is about the credibility of F1 as a worldwide sport. I have said before that Bernie should be giving races away in the States, if it means that we could have two or three good USGPs. He may say that the US market is less important than it used to be but perhaps he should be asking the FIA's new bosses, the manufacturers, about that. Mercedes, BMW, Toyota and Honda are heavily committed to the States and would welcome any increased exposure they can get through F1, I'm sure. This is the moment when F1 could make a major breakthrough in America. With one or two more races, it could easily surpass the open-wheel competition in attracting viewers. Everyone is running scared of NASCAR these days, convinced that it has the American market completely in its pocket, but that is not entirely true. NASCAR is such an American form of motor racing that it will always have a large fanbase in the States; but there is still that yearning for things European in some American hearts, that feeling that Europe somehow does it better - and F1 should be capitalizing on that. F1 may never have as large a following as NASCAR in the States - in fact, it would be surprising if it ever approached such figures. Yet we are talking of one of the largest markets in the world here and that means even a small percentage of viewers is still a matter of millions of eyeballs. One percent of the television viewers in the US would be a much bigger audience than, say, ten percent in Britain. SpeedTV is doing an excellent job of televising and promoting F1 in the States - from what I hear of ITV's coverage in the UK, it has now descended to the level of a Lewis Hamilton benefit show, whereas SpeedTV has live coverage of Practice, Qualifying and the race itself (somewhat handicapped by Fox handling the races this year) and their website is a model of good, in-depth information on the sport. The FIA should be putting all its effort into encouraging this service by making sure that the races are worth watching. As usual, Bernie does his sabre-rattling routine to ramp up the price of his show. It'll probably work, but it doesn't exactly impress anyone. I believe his bluff has been called m8 as there wont be a race in 2008 and im bloody well pissed off about it. I have to watch speed tv for coverage of formula one and i am not a huge nascar fan but i LOVE FORMULA ONE now it wont be in the states really is a pisser. I hope it all comes together befor the end of the year or there wont be a f1 in the USA and that would be a tragic blow to your sport as there is a huge fan base here. I live only 1 1/2 hr from the track in Indy and i go every year. I cant believe there wont be a race.